In early high school I was taught history by a tiny, somewhat obsessive nun called Sister Marie. She expressed such profound sadness and anger at what she always called history’s strongest attempt to eradicate Catholicism that we could be forgiven for thinking she’d lived through the period herself (a notion that as teenagers we were prepared to countenance because all the nuns we knew were really old but that as an adult I’ve had to admit is unlikely). I think Sister Marie might have liked C.J. Sansom’s depiction of the period even though his protagonist is one of Cromwell’s men. Because even if mysteries are not your thing, the book offers a very realistic sense of people living through tumultuous change. In 1537 at a Benedictine monastery in the south of England the commissioner sent by Cromwell to negotiate the monastery’s voluntary surrender is murdered. Lawyer Matthew Shardlake and a young clerk are sent by Cromwell to investigate. They find the monastery and its monks in such physical and spiritual decline that more than one murder is committed within the supposedly holy site before events are resolved. It is a testament to Sansom’s writing and storytelling abilities that soon after I started reading I virtually stopped caring about who had killed Commissioner Singleton. Getting to know Matthew Shardlake is probably the book’s biggest treat. He is, of course, a Reformist but over the course of the story what he sees and learns does cause him to have some doubts, if not in his religious convictions then in the motivations and methods of those charged with leadership of the Reformation. His own personal circumstances, including the physical limitations caused by him having a hunchback, also result in internal conflict. I like that Matthew has physical and psychological imperfections and is aware enough of these to at least understand, if not always prevent, the effects they have on his behaviour and thinking. There are numerous other characters in the book but never so many that the reader feels lost amidst all the names. Collectively they show us the gamut of human experience as great changes occur including zealotry (for and against), fear, insecurity and hope. We see some people lament the loss of old ways, others eager to embrace the change and in both cases there are those with genuine belief and others motivated more by self-interest. Although in some ways the book is very specifically grounded in the time and place of Sansom’s chosen setting there is also a timeless quality to this depiction of people and communities in flux. Sister Marie’s somewhat eclectic syllabus aside, I can’t claim to be any kind of expert in this period of history but the historical details do feel authentic to me and the language choice is spot on: reminding us that we are in another time but not so archaic as to require constant need of a reference text. Unlike me, Sansom doesn’t forget that he is telling a yarn and the plot unfolds superbly amidst all the fascinating historical details and character development. There are some surprises in the resolution even for a seasoned mystery reader and the motivations ascribed to the novel’s criminals are credible. I shouldn’t have been surprised that I enjoyed this book so much because I’ve heard nothing but good things about it and is successors but I am delighted to have made the discovery for myself. 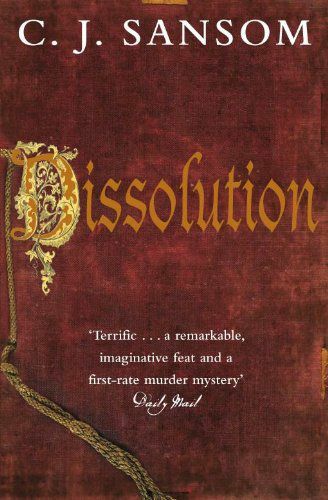 If you are similarly late to the party then I highly recommend DISSOLUTION. I was prompted to pluck this title from the TBR shelves where it has languished for five years because I noticed it is due for discussion at Confessions of a Mystery Novelist where Margot will shortly put the book In The Spotlight. This entry was posted in book review, C.J. Sansom, England. Bookmark the permalink. This is a great series, isn’t it, Bernadette? I’m very glad you enjoyed this novel. I think Sansom does a very good job of sharing the history without ‘information dump.’ And I do like the Matthew Shardlake character. As you say, he’s a fully fleshed-out character, and you do get to see the mystery through his eyes, which I find fascinating. I am also late to the party, but I do have a copy of this book. So now I am encouraged to get to it in the next few months. I have never thought this period would appeal to me in a mystery novel, but I have also heard so many good reports on it I thought I should give it a try. My partner and his dad are massive fans of these series and I keep meaning to delve in! Thanks for a spoiler-free review. I will have to pinch them from his bookshelf! I read this when it first came out and it entranced me, I was so impressed. I have enjoyed all the subsequent books, but this one was the best – partly because I wasn’t a fan of historical mysteries, so didn’t have high expectations.